Need more information about booking Home 7253497 ? This apartment can lodge up to four adults (or six in case of family with children); a baby bed is available free of charge. The double bed in the bedroom can be made into two individual beds. The apartment has double-glass windows and is noise-insulated. The bathroom has a Jacuzzi! The apartment is located nearby Vondelpark. Very easy within easy reach from the airport. Tram (streetcar) stop is in front of the apartment and will bring you to the city center within 15 minutes. Or you can walk through the famous Vondelpark to the entertainment center 'Leidseplein' where you will find Amsterdam's night life. Also the Rijksmusuem, Van Gogh Museum and the 'Concertgebouw' are withing 15-20 minutes walk. The living room has two convertible sofa beds's for one individual person, for a couple, or for two children. There is a expendable dining table for up to 6 persons. You will find large flat screen television with cable connection, a radio/dvd player with surround system. There is a provision of guide books in English, French and in German. The living room is facing the Overtoom but the entire apartment is noise-insulated and little or no traffic noise is penetrates. 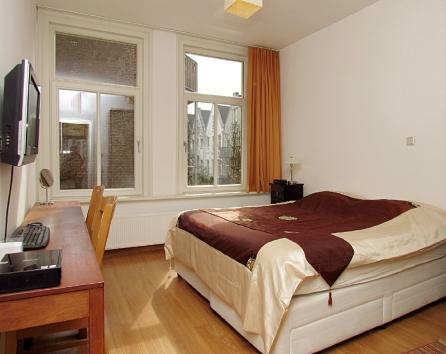 The bedroom which faces Vondelpark, has one large boxspring bed that can be made into two individual beds. There is a large cabinet, side tables, wall-mounted flat screen television and computer with wireless internet connection. The spacious bathroom is equipped with Jacuzzi bath! There is also a washing machine and a hairdryer. The kitchen is fully equipped with a multi-functional microwave oven, a dishwasher, Senseo coffee AND Nespresso coffee machine, kitchen aids, etc. You will find a supply of amenities, like coffee, tea, sugar and salt, etc. There is a computer in the bedroom with a headset. You can also bring your own laptop computer and connect for free (WiFi). no drugs allowed ('coffee shops' are available. Consumption of any drug outside coffee shops is illegal and not tolerated in spite of general conception). A damage deposit of € 100.00 (or equivilant in other currency) is required if the occupancy is for more than 2 persons. Vous pouvez communiquer avec le propriétaire en français. Sie können auch auf Deutsch korrespondieren.